Evermotion Archmodels vol. 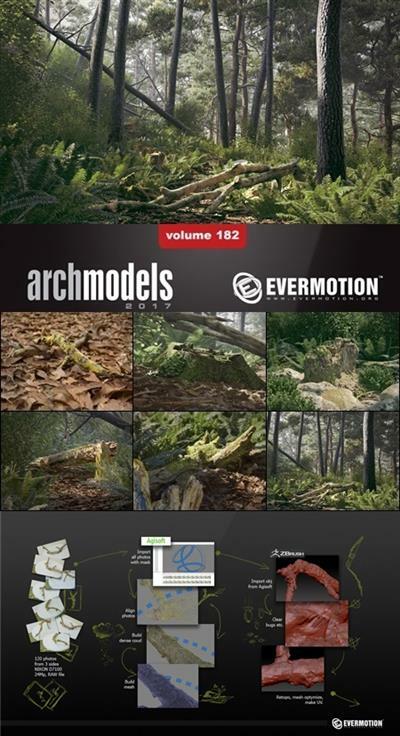 182 is a collection of 56 sets of models of branches, trunks, cones and stones – over 100 separate models are included (with textures and materials). We also are giving you a complete forest scene (3DS MAX and V-Ray) that you can see in the promotional video below. The scans were made in the most ecologic region of Poland, the land of the last natural forest in Europe. All items in this collection were carefully scanned in north-european woods. They are perfect as the secondary elements in your visualizations – they will give a natural look and feel to your exterior shots. These items are suitable not only for creating fleece in the forest, they are also perfect for making natural looking surroundings of trees in your visualizations, for example – they can be great to put some variety to the lawn or rock garden.